After several years of hibernation, one of the greatest production company on the continent of Africa, Venus Film Production has emerged in a unique style to claim its rightful spot in the movie industry, especially in Ghana. 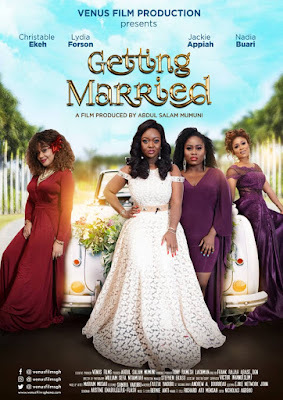 With storyline heavily sitting on the shoulders almost everyone in the movie, it's an inter and intra-connected romantic comedy. Faith (Played by Jackie Appiah) is an ardent worshiper and believer in the biblical teachings from her father, who is a pastor, but she keeps close crazy friends like Peggy (Played by Christabel Ekeh), Jessica (Played by Nadia Buari) and Efua (Played by Lydia Forson), These friends helped her prepare for her wedding with her longtime sweetheart, Jordan (Played by Fiifi Coleman). A few hours to their wedding, Faith discovered that Jordan is having secret affair with his mother. Will she go ahead with the wedding plans? Her discovery led to a whole lot more which will keep you on the edge of your seat at cinemas. Meanwhile, John Dumelo plays the character Malvin, who always steals money from his girlfriend, Peggy, theirs look rocky but what of Efua who have been living with William (Played by David Ankrah) and his daughter for the past three years yet no single sign of proposal, Jessica seems to be the only one enjoying an open relationship with Walter (Played by Elikem Kumordji). The twist and turns in this Frank Rajah directed movie makes it the right therapy for your Christmas holidays as it scheduled to be premiered on December 24, 2018, at Silverbird Cinemas, Accra Mall and West Hills Mall, and also Watch and Dine Cinema, Kumasi at 7 pm and 9 pm sharp for GHC 40. Whet your appetite with the official trailer below.